As part of MSS Security’s commitment to operate ethically, legally and professionally, we have all the appropriate certifications and compliances in place. Fully licensed and insured. MSS Security is a registered security agent and licensed in all Australian states and territories. We hold appropriate insurance for the supply of our services. Exceptional safety record. 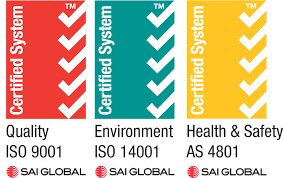 Our safety and risk management program is backed by a documented health and safety management system that complies with AS/NZS 4801:2001 and is certified by SAI Global. Quality Assurance. We ensure our processes and systems meet our clients’ requirements, as well as those outlined in legislation. Our commitment to quality assurance is demonstrated through our national accreditation to ISO 9001:2015 (SAI Global). Environmental commitment. MSS Security is committed to the protection and sustainability of the environment through our Environmental Policy and the implementation of an Environmental Management System that is certified to ISO 14001:2015. Registered Training Organisation (RTO). The MSS Security Training Academy is a RTO that runs a variety of industry, customer service and client specific programs for MSS Security employees. Regular training ensures our people are best positioned to deliver the highest level of service to our customers, while offering them the opportunity to develop challenging and rewarding careers as our employees by improving their skill sets. Suitable documentary proof is available on request.